You may know them as Ladyfingers but these long finger- or oval- shaped sponge cookies are also known around the world as Boudoir biscuits, sponge biscuits, sponge fingers, Naples biscuits, Savoy biscuits (Savoiardi) and biscuits la cuiller. Although these delicate and sweet tasting sponge cookies can be eaten on their own or as an accompaniment to ice creams and sorbets, they really shine when soaked in a syrup and used as part of more complex desserts such as Tiramisu, English Trifles, or Charlottes. Ladyfingers are made from a sponge cake batter where the egg yolks and sugar are beaten together until very thick and then flour and beaten beaten egg whites are folded in. Their unique "finger" shape is the result of piping the batter onto the baking sheet. The final touch is to dust the tops of the unbaked cookies with powdered sugar before baking to give them a crisp yet sweet outside crust. These ladyfingers are definitely at their best the day they are made. Keep in mind that homemade ladyfingers are not the same as store bought. The commerically made Savoiardi tend to be much more crisp and firm. 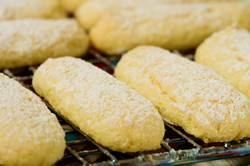 Whereas homemade Ladyfingers are more soft and pliable. Ladyfingers: Preheat oven to 400 degrees F (200 degrees C) and line two baking sheets with parchment paper. Have ready a large pastry bag fitted with a 1/2 inch (1.25 cm) plain round tip. To make the piping of the cookies easier, use a pencil and ruler to divide the parchment paper into four - 3 inch (7.5 cm) rows, spacing the rows about 1 inch (2.5 cm) apart. Separate the eggs while they are still cold, and cover the whites and yolks with plastic wrap to prevent a film from forming on the egg yolks and the whites from drying out. Let the yolks and whites reach room temperature before using (this will take about 30 minutes). Then, in your electric mixer, fitted with the paddle attachment, (or with a hand mixer) beat the egg yolks and 1/3 cup (65 grams) white sugar on high speed until the mixture becomes thick and pale yellow. (When you raise the beaters the batter should fall back into the bowl in a slow ribbon.) (This will take between 5-10 minutes.) Beat in the vanilla extract. Sift the cake flour and salt over the batter but do not fold in. In a clean bowl, with the whisk attachment, whip the egg whites and cream of tartar on medium speed until soft peaks form. Gradually add the remaining 1/3 cup (65 grams) white sugar and whip until stiff peaks form and the whites are glossy. Fold the whites into the egg yolk and flour mixture in three additions, mixing only until incorporated. Transfer the batter to your pastry bag and, holding the bag at about a 45 degree angle to the baking sheet, pipe the batter into 3 inch (7.5 cm) long ladyfingers, using the lines drawn on the parchment paper as your guide. Space the ladyfingers about 1 inch (2.5 cm) apart. Remove the baking sheets from the oven and immediately slide the parchment paper (with the ladyfingers) from the baking sheet onto a wire rack. Let the ladyfingers cool for a minute and then remove the ladyfingers from the parchment paper, using a flat spatula or knife, and let cool completely on a wire rack. (If you left them completely cool before removing them from the parchment they tend to stick and are hard to remove without breaking.) The ladyfingers are best the day they are made. So if not serving that day, it is best to freeze them. To freeze, place in a plastic bag between layers of wax or parchment paper and freeze up to one month. Makes about 40 - 3 inch (7.5 cm) Ladyfingers.